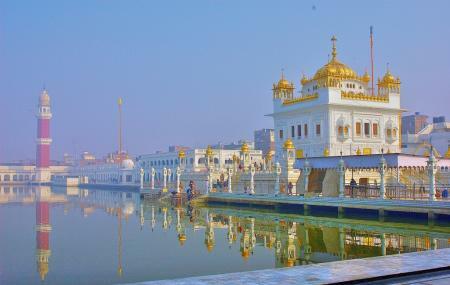 To visit the Tarn Taran Sahib, you would have to take a short drive for about 22 kilometers from the city of Amritsar. Tarn Taran Sahib is basically a Gurudwara treated as the most sacred place by the Sikhs. The highlight of this Gurudwara is its holy tank (sarovar) which got the title of being the largest holy tank in the world. The Tarn Taran Sahib is a perfect place to experience complete peace. Love this? Explore the entire list of places to visit in Amritsar before you plan your trip. Fancy a good night's sleep after a tiring day? Check out where to stay in Amritsar and book an accommodation of your choice. How popular is Tarn Taran Sahib? People normally club together Goindwal Sahib and Hyatt Amritsar while planning their visit to Tarn Taran Sahib. Its a big gurudwara having big pool and holy water. Food is available in langar for free .Many people visit here among them are some tourists also. There is good market available here. Parking is also available in abundance. Really nice experience , this place is very peaceful , and the sarovar is well maintained & cleaned .